Have you ever thought of visiting an important city, rich of history and culture, at night? A millenary Rome coloured by the moonlight that shows itself vulnerable to the tourists. The romantic tourists who love seeing every aspect of the city, of the art and architecture. Why do not discover the Imperial Fora at night? Rome has thought about lighting up in order to let tourists from all over the world see it shining. Think about the majestic Colosseum, an amphitheatre rich of history, an arena who has seen every type of spectator and could hold about 50,000 of them; colossal undertaking gladiators, animal fights and many more representations. The public – who didn’t pay the ticket – was of all sorts: doctors and magistrates could follow the show from the highest and best positioned places, while for the humble families there were the lower ones. But everyone was present at the shows in the Colosseum. The symbol of the city and of Italy at night takes not only an architectural importance, but also emotional. The Fora are dedicated to the greatest Emperors, such as Trajan, Augustus, Nerva and Vespasian. The Trajan’s Column commemorates his great military exploits: Trajan fought in Dacia in the II century A.D. In this way Rome celebrates the importance of the Emperor. 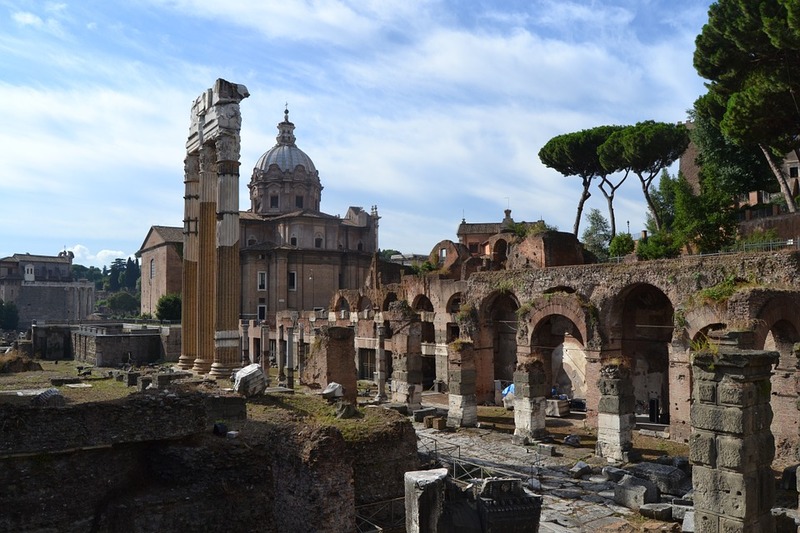 The same happens with the Forum of Augustus and Nerva, the latter razed to visit the ruins of the Forum of Vespasian. It will be possible to visit the Roman Forum at night. Its development is dated to the VII century B.C. A unique lighting has been studied for the present ruins and it allows you to live an exceptional emotion, an historical experience. You can assist at the show of the Roman Temples, such as the Temple of Saturn or the Temple of Castor and Pollux, and of the Arch of Septimius Severus. The piazza of the Capitoline Hill is a symbol of the city, rich of art and culture. It has been carried out by the Master Michelangelo, it is a technical demonstration and expression of the Italian Renaissance. The piazza is situated on the Capitoline Hill, and it has been the seat of the civil administration of Rome since medieval age. This entry was posted on Monday, March 7th, 2016 at 9:34 am	and is filed under Discover Italy. You can follow any responses to this entry through the RSS 2.0 feed. You can leave a response, or trackback from your own site.